Executives often want to have a quick overview of some key metrics to find out what the state of their business is. Questions like: Are my margins on target? Is customer satisfaction within an acceptable range? What is the size of my pipeline? All this information is typically summarized in a dashboard. The easy thing is to simply put this into a table. But tables are hard to read. And they take up a lot of space. 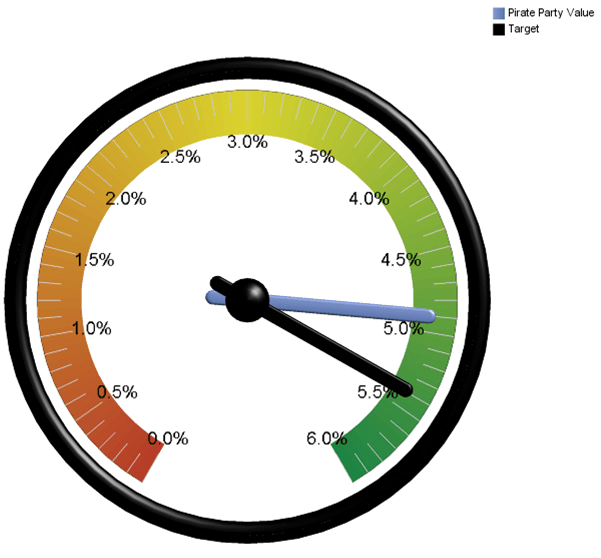 The other popular option is to put the data into a gauge chart. But gauge charts take up a lot of space, too. And if we are honest with ourselves: they are really hard to read. Granted they look cool. But do they tell a story in an effective and efficient manner? Probably not. Let’s take a look. The above example shows the election results of a fictitious political party. The blue bar in the middle indicates the actual value (4.8%). The short black bullet towards the top indicates a target measure (e.g. budget, forecast, etc.). Color shades display ranges of performance (e.g. poor, acceptable, good). We can quickly see that the party missed the target but the result falls into the acceptable range. It is indeed a very simple chart that provides a lot of information in a concise manner: Target, Actual, Performance Rating. 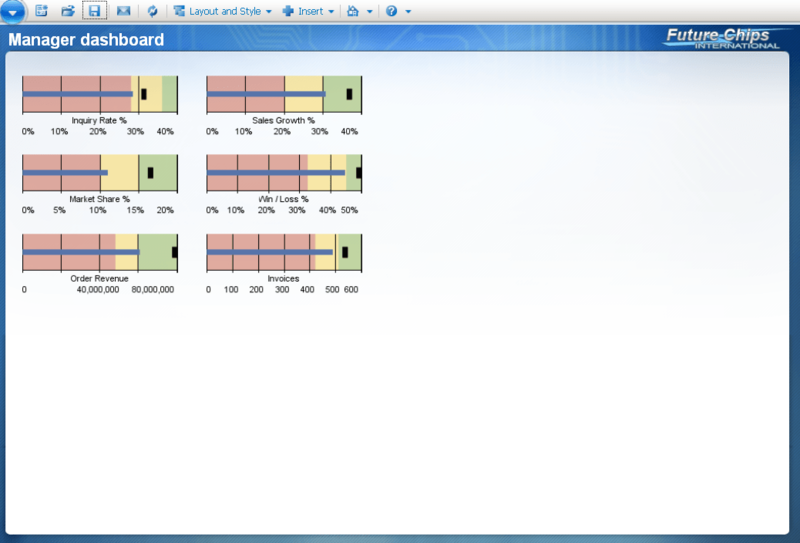 In Cognos 10, you have the ability to set five different performance zones in different shades or colors. One the things I like about the bullet charts is the fact that you can easily stack them. That makes the bullet chart an ideal way of communicating multiple measures in a dashboard. It is easy to get a quick overview and the stack is very space efficient. In Cognos 10, we can have vertical or horizontal bullet charts. Toss those gauges! Take a look at the bullet charts next time you design a dashboard. But make sure to train your users. Despite its simplicity, I have seen some people struggle to understand this chart. We don’t want our users to bite another bullet, right? Previous Previous post: Charts? Yes, I know….